After Sarah Miles 2014 Irish Tour; Details at Gallarus Productions. After a lifetime of wrestling with the tides fisherman Bobeen finds it hard to face the sea now, but what he discovered in the mouth of the harbour almost thirty years ago keeps calling him back. This time it will connect him to what he thought was lost and gone forever. This brand new play written and directed by Michael Hilliard Mulcahy is a beautifully written and performed story. It is a perfect example of the transformative work we do at Floating World in that the audience is transported into the world of this epic yet ordinary story. The story and the performer stand at the centre of this space and reveal truth, beauty and heartache, as one reviewer commented: ‘pure art’. This is our first time producing a pure storytelling theatre piece and we couldn’t have chosen a better play. 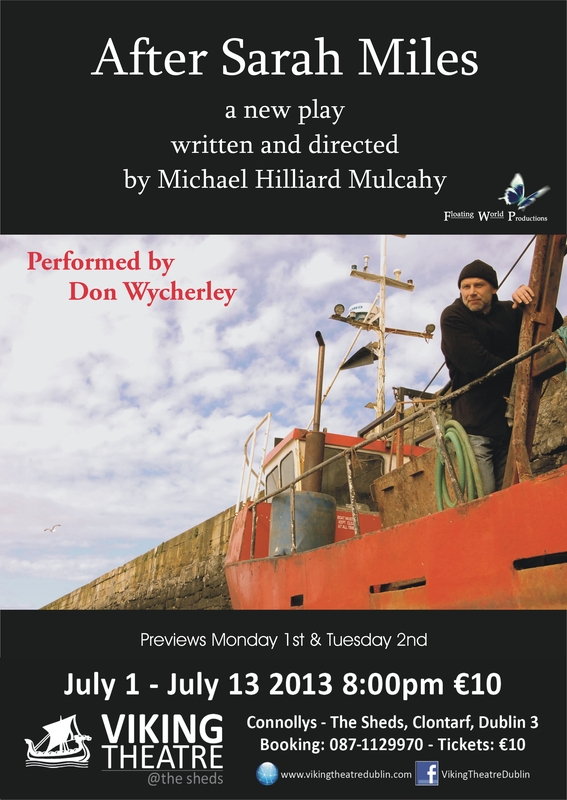 In July we had a sell out run at Viking Theatre, Clontarf with standing ovations every night and fantastic reviews. Michael is a writer, director, actor. His debut production Beyond the Brooklyn Sky produced by Red Kettle and directed by Peter Sheridan opened in Garter Lane Theatre in Waterford in September 2012 before it’s run at Dublin Theatre Festival. It played to packed houses, standing ovations and brilliant reviews. Michael won the Eamon Keane Full Length Play Award at the Listowel Writers Week Festival for his play Waves in 2010. As an actor Michael has performed in various roles at Siamsa Tire, Everyman Theatre, Garter Lane Theatre, The Abbey Theatre and The Gaiety Theatre. He also appeared in several episodes of Fair City and a short movie ‘Skint’ which was filmed in Dingle recently. After Sarah Miles is Michael’s second play to be produced and he is currently working on many more.